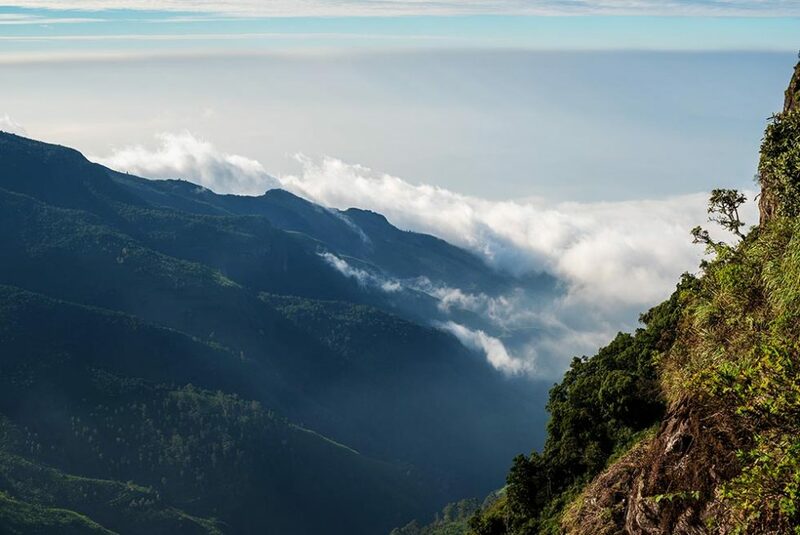 Horton Plains, Sri Lanka is a lovely park and not only for the Worlds End but for the chance to experience one of the most preserved ecological reserves in the world. Enjoy Horton Plains, and respect the local life, the air, the animals and they will appreciate your gesture. The sound of birds is the music that you will want to ear, and you will be amazed for your time there. In there you will discover several species of migratory birds and very rare that you will not find anywhere else. Moreover, upon reaching the peaks, you will be confused with yourself: whether you are walking on the clouds or if the foamy mist came down and embrace you. One thing is certain, Horton Plains is the beginning of a great adventure in search of the meaning of life and the importance of taking care so that one does not miss the beautiful and natural. Be it the stimulating coffee, the fall of the crystal clear waters, the transparency of the streams, the narrow rails, the attentive eyes of the animals are moments that will indeed make a difference in your life! Come with us that adventure has begun! What to see in Horton Plains? How to reach Hortons Plains? Is it possible to stay in Hortons Plains? Horton Plains sits on the highest and coldest point of Sri Lanka. Be prepared for the unpredictable climate change that can occur. Later we will talk about the best time to visit the park. Because of this, bring warm clothes, comfortable shoes, sunglasses, hats. Also, if possible check the place you are staying with the possibility of taking a meal for you to eat as soon as you arrive (you will feel hungry). Beware of extremes, respect the safety signs. In there already happened some situations where the lack of responsibility and attention, was the end of the world for some travelers who crossed the border. Another tip is not to carry plastic bags, it is vital to preserve the park so that it continues with the fauna and flora vivid. If you take some plastic, park staff will replace them with recyclable bags. Horton Plains is a park located on the central plateau of Sri Lanka and according to history, was discovered by the farmer Thomas Farr at the beginning of the 19th century. Then a few years later, it was named Horton Plain in honor of the governor of Sri Lanka (formerly Ceylon). Since 1988 the forest reserve has been declared a National Park and since 2010 has been announced as a World Heritage Site by Unesco. The park is surrounded by streams and canals being close to the highest peaks in the country such as Mount Kirigalpotta Kanda and Mount Thotupola Kanda. 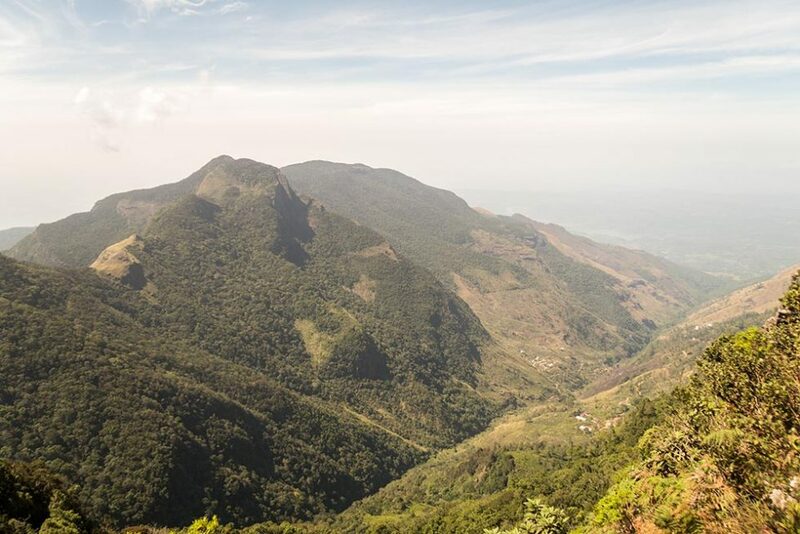 Horton Plains is located between Ella and Nuwara Eliya and to be well situated in the park you can download the Maps.me App and have access to all the trails that other travelers share in there. Then start your adventure as soon as the sun rises after 6am until the maximum at 10am. Because at this time the clouds have not yet come down and you can see all the movement, the fields of tea plantations, and even the ocean on the other side. If you can not get there at this time, you have the feeling that you really are at the end of the world. That’s because it will look down and see the clouds covering the bottom and providing a dramatic backdrop. The park runs from 6 am to 6 pm. Upon arrival, you will pay tourist fee equivalent to 1,150 rupees. On this walk to the End of the World, cross the tracks and take advantage of every opportunity of this adventure. 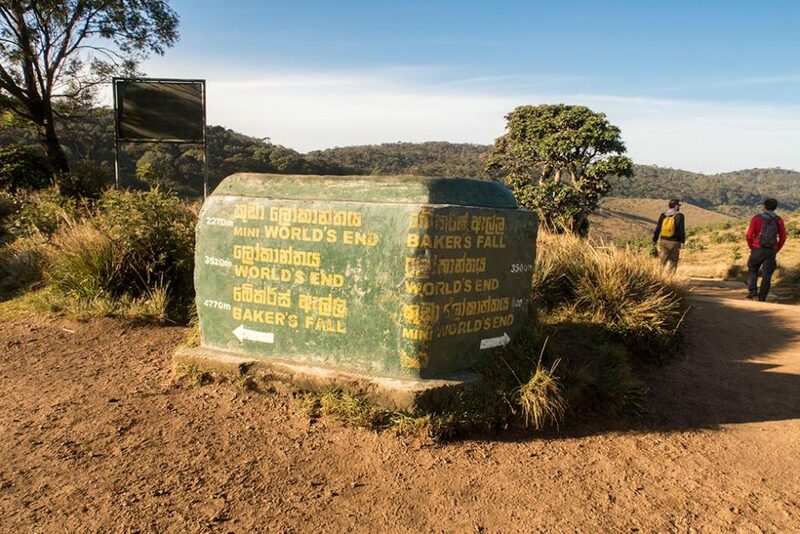 Check out what to do towards the main attraction World’s End in Horton Plains Park. Trekking in Horton Plains is not very complicated, it depends on a long walk through the woods. While not reaching the World’s End, take the 9-kilometer hike, about 3 hours to take pictures and enjoy the beauty of the plains and mountains. The course itself is flat. The trail is circular, and there are not many obstacles as the Little Adams Peak. For this, you will have the options to move to the right or left, any of them will take you to the desired destination. As soon as you begin the trail, you will be rewarded with wildlife, pastures, and species of spice shrubs. Arrive early at the park preferably at 6 o’clock in the morning, to make the trekking restful and arrive at the World’s End before 10 o’clock. After this time, the place is filled with fog, and it will be difficult to see anything. The World’s End is the famous End of the World and the beginning of a spectacular sight. It is located at the southern end of Horton Plains Park at an altitude of 2140m and descends to 900 meters. When looking at the south coast, your vision will be confused amid the immensity of vegetation and magnificent contrasts. Turn your view down and see the 1200 meters in the background and no division between you and the depths. The height is so impressive, and if the valley is already covered by clouds, you will not know if the clouds have descended or if you are above them. As said, try to go earlier before the fog arrives and disrupts your experience. But it all depends on good weather in the day. Otherwise, you will not be able to see anything. Below we talk about the best times to visit Horton Plans. Continue reading. Little World’s End if you are going on the left is a small demonstration of what you will see ahead or if you go to the right is the last attraction of Horton Plains. Little World’s End and World’s End, both are areas with a steep slope, 100% natural, with a dense forest. When looking at the cliff, you can not see anything built by man, all natural and with such perfection. In regards to World’s End, the space to see the scenery of Little World’s End is smaller, but it is not without its impressive. The Bakers Fall is a beautiful waterfall that you’ll find on your way through the Hortons Plains. It is about 20 meters high. The waterfall is so intense and foamy that they merge with the contrast of the stones. The jungle next door is really amazing. Be careful to climb the waterfall, although it is easy, it is very slippery and steep. Climbing the waterfall to the trail will leave you breathless because of the altitude. Anyway, it’s worth the experience. The wildlife of this place is diverse, with animals living in freedom. Your experience and records with them will be as you go through the jungle and meet them. Surprise yourself with several species of ferns or see the vivid colors of the orchids as if they were hand painted. Larger animals hardly show up mostly the leopard – symbol of Sri Lanka. But walk the path in the rhythm of the songs of the migratory birds. This place is ideal for birdwatchers. It is where other species of animals live, some even live in that place or are threatened with extinction such as horned lizard, striped neck maggot, herds of deers, long-tailed giant squirrels, monkey bear, fishing cat, wild boar giant-tailed deer, among other exotic animals. There’s an animal you’ll miss in this park: the elephant, and we’ll tell you why. A few years ago, Horton Plains was full of elephants, but during the colonization, the British hunted until they were never seen again. It is in the Horton Plains that another species of animal was discovered as if it were of the subspecies of the thin red loris. They were studied and confirmed as a new species of animals. The Farr Inn is the meeting place for coffee and literally warmth to start your journey. It is next to the parking lot and is the first step towards Horton Plains Park. Before, this place served as accommodation for the British and today is a cafeteria that welcomes travelers visiting the site. Also, you will see pictures with stories of local fauna and flora and a shop selling books related to the park’s culture. If you are willing to take the train and go to Horton Plains, you can go from Haputale, Ella or Nanu Oya by the direct train journey. There are two train stations: from Ohiya village about 10 km from the park and another in Pattipola located at the highest point of Sri Lanka on the return from Nuwara Eliya. 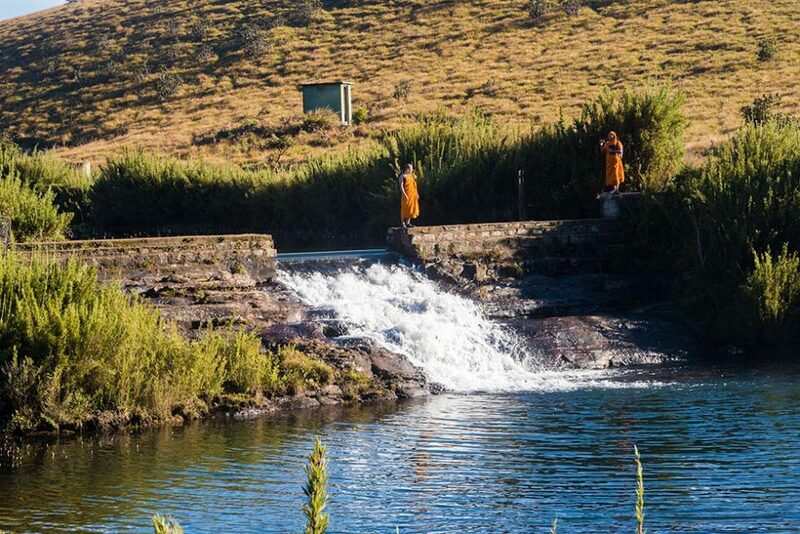 Another tip is that if you are in Nuwara or Ella just rent a jeep with a driver and drive to Horton Plains. Now try to go with more people, because it will be more comfortable and more economical to share the expenses. Usually, the trip takes about 3 hours. Check out for more information about transportation in Sri Lanka and stay inside the possibilities and how to move from one city to another with safety. If you want to get closer to nature, there are 3 places that many travelers can camp. 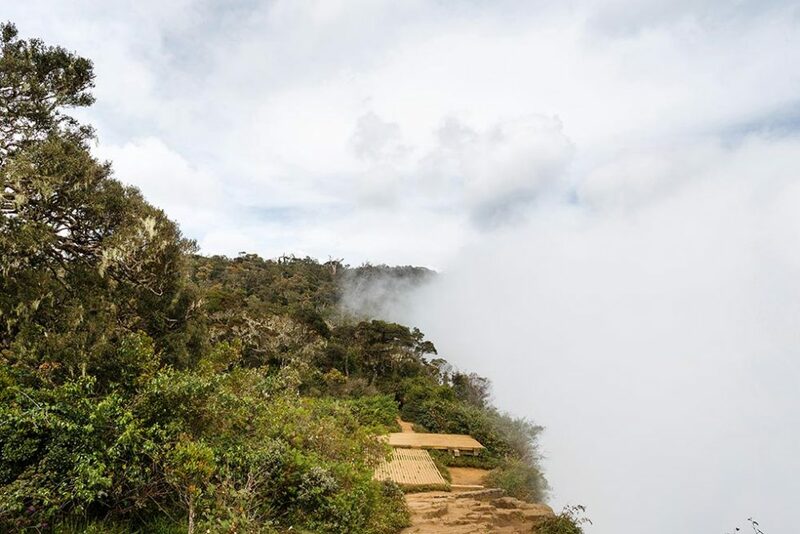 It has one detail: unlike the other parks, in Horton Plains, you will have to carry your luggage wherever you go, and this is a bit uncomfortable, especially when trekking. Because of this, the ideal is to stay in Ella or Nuwara Eliya and go to Hortons Plains from there. So you know more places in less time. The climate of the park is cold as we say, similar to a mountain rainforest. Just remember our Amazon Forest that you will understand a little of what we are talking about. Temperatures are between 14ºC and 16ºC with low humidity. Remember to get a health insurance when traveling to these places, it is essential to have an emergency relief valve, especially when it comes to temperature drops. The region of the park receives more rains than the highlands. In drier times, temperatures drop further to 5 ° C, accompanied by frost and frost. Avoid traveling between May to June, when the fog comes and covers the entire park. Because of this, the best time to visit is between November and March. Watch out for the monsoons that ravage the country. Read the article on the climate in Sri Lanka and understand more about them before planning your trip. 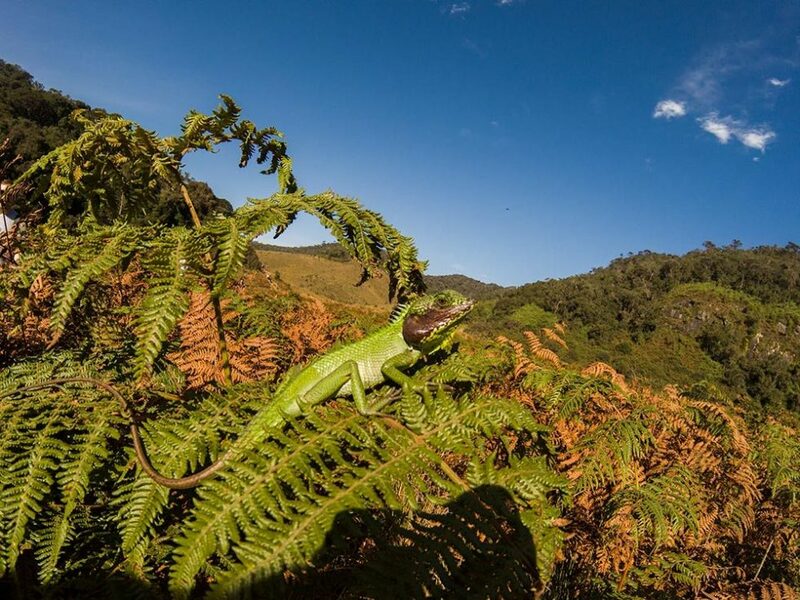 Did you see how Horton Plains is exciting and worth your visit? If you are passionate about nature and the beautiful views, you will love knowing the details of this place. Do you like Hortons Plains, Sri Lanka? The country has many more attractions, check now our article on the trip to Sri Lanka and know the other places that you can not miss! Horton Plains, Sri Lanka é um parque encantador e não é somente pelo Worlds End (Fim do Mundo), mas pela oportunidade de conhecer uma das reservas ecológicas mais preservadas do mundo. Que não seja por menos, existem várias espécies de aves migratórias e raríssimas que você não as encontrará em nenhum outro lugar. Além disso, ao chegar nos picos, ficará confuso consigo mesmo: se está andando sobre as nuvens ou se a neblina espumante desceu e o envolveu. Uma coisa é certo o Horton Plains é o começo de uma grande aventura em busca do sentido da vida e a importância de cuidar para que não se perca o belo e natural. Seja o café estimulante, a queda das águas cristalinas, a transparência dos riachos, os trilhos estreitos, os olhares atentos dos animais são momentos que de fato farão a diferença em sua vida! Venha conosco que a aventura já começou! 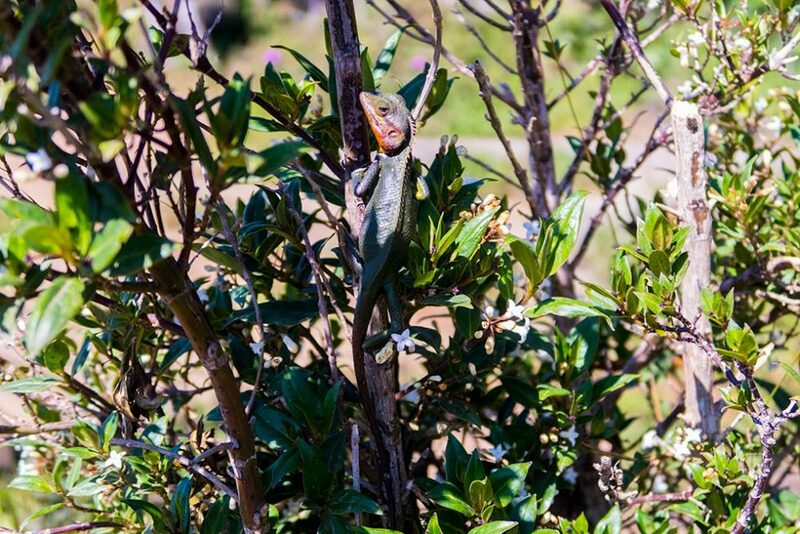 O que visitar em Horton Plains? Como chegar à Hortons Plains? É possível ficar em Hortons Plains? Horton Plains fica no ponto mais alto e frio do Sri Lanka. Esteja preparado para as imprevisíveis alterações climáticas que podem ocorrer. Mais a frente falaremos sobre a melhor época de ir visitar o parque. Por causa disso, leve roupas quentinhas, sapatos confortáveis, óculos de sol, chapéus. Além disso, se possível verifique no lugar em que está hospedado a possibilidade de levar uma refeição para você comer assim que chegar ao local (você vai sentir fome). Cuidado com extremos, respeite as placas de segurança, já teve situações em que a falta de responsabilidade e atenção, foram o fim do mundo para alguns viajantes que ultrapassaram os limites. Outra dica é não levar sacolas plásticas, é importante preservar o parque para que continue com a fauna e a flora vívidos. Caso levar, o pessoal do parque as substituem por sacolas recicláveis. Horton Plains é um parque localizado no planalto central do Sri Lanka e segundo a história, foi descoberto pelo agricultor Thomas Farr logo no começo do séc XIX. Depois alguns anos mais tarde, recebeu o nome de Horton Plain em homenagem ao governador do Sri Lanka (antigo Ceilão). A partir de 1988 a reserva florestal foi declarada como Parque Nacional e desde 2010 foi declarado Patrimônio da Humanidade pela Unesco. O parque é cercado de riachos e canais sendo próxima aos picos mais altos do país como: o Monte Kirigalpotta Kanda e o Monte Thotupola Kanda. Além disso, Horton Plains fica entre Ella e Nuwara Eliya e para ficar bem situado no parque baixe o App Maps.me e tenha acesso a todos as trilhas que os viajantes enviaram. Depois, comece a sua aventura assim que o sol nasce logo após as 6h até o máximo as 10h. Porque nessa hora as nuvens ainda não desceram e você consegue ver toda a movimentação, os campos de plantações de chás, e até o oceano do outro lado. Caso não consiga ir neste horário, você terá a sensação de que realmente está no fim do mundo. Isso porque olhará para baixo e verá as nuvens cobrindo o fundo e proporcionando um cenário dramático. O funcionamento do parque é das 6 da manhã até as 6 horas da tarde. Ao chegar você pagará taxa de turista o equivalente a 1.150 rúpias. 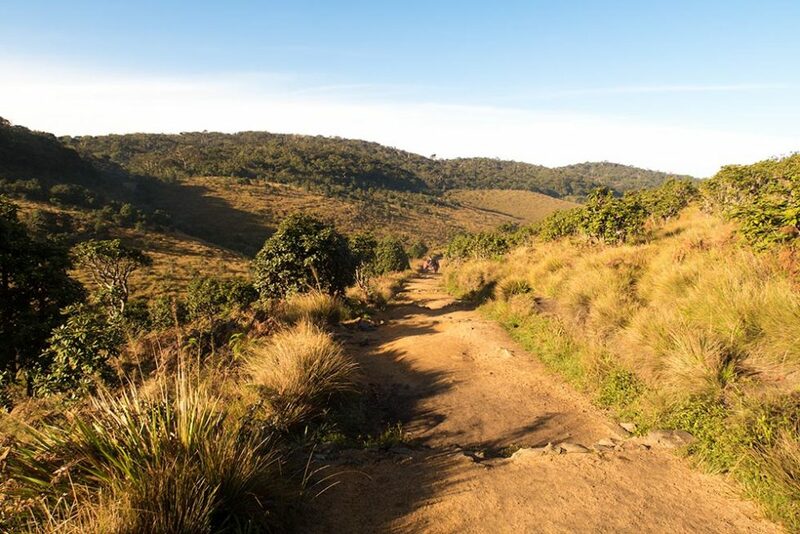 O trekking em Horton Plains não é muito complexo, depende de uma longa caminhada pela mata fechada. Enquanto não chega ao World’s End, aproveite para caminhar os 9 km, cerca de 3 horas para tirar fotos e apreciar a beleza das planícies e montanhas. O percurso em si é fácil e plano. A trilha é circular e não existem aqueles obstáculos como o Little Adams Peak. Para isso, você terá as opções de seguir para a direito ou a esquerda, qualquer uma delas o levará ao destino desejado. Assim que começar a trilha, você será recompensado com a vida selvagem, as pastagens e espécie de arbustos de especiarias. Chegue bem cedo ao parque de preferência as 6 horas da manhã, para fazer o trekking descansado e chegar ao World’s End antes das 10 horas. Depois desse horário, o lugar é tomado por uma neblina e fica difícil ver alguma coisa. O World’s End é o famoso Fim do Mundo que mais parece ser o início de uma visão espetacular. Ele fica localizado no extremo sul do parque de Horton Plains a uma altitude de 2140m e desce a 900 metros. Ao olhar para a costa sul a sua visão ficará confusa em meio a imensidão de vegetação e contrastes magníficos. Volte a sua visão para baixo e veja os 1200 metros ao fundo e nenhuma divisão entre ti e as profundidades. A altura é tão impressionante e, se o vale já estiver coberto por nuvens, não saberá se as nuvens desceram ou se você está acima delas. Como dito, tente ir mais cedo antes que a névoa chegue e atrapalhe a sua experiência. Agora, não podemos enganá-lo tudo depende de um bom clima no dia, caso contrário não conseguirá ver nada. Mais abaixo falamos sobre as melhores épocas para visitar Horton Planes. Continua a leitura. O Little World’s End caso esteja indo pela esquerda é uma pequena demonstração do que se verá mais a frente ou se for pela direita é a última atração do parque Horton Plains. Tanto Little World’s End como World’s End, ambas são áreas com uma encosta bem íngreme, 100% natural, com mata fechada. Ao olhar para o precipício não se vê nada construído pelo homem, tudo natural e com tamanha perfeição. Em relação ao World’s End, o espaço para ver a paisagem do Little World’s End é menor, mas não deixa de ser impressionante. A Bakers Fall é uma cachoeira linda que você encontrará em seu caminho pelo Hortons Plains. Ela possui cerca de 20 metros de altura. As quedas de águas são tão intensas e espumosas que se fundem com o contraste das pedras. A selva ao lado é realmente incrível. Tome cuidado para subir a cachoeira, embora seja fácil é escorregadia e íngreme. 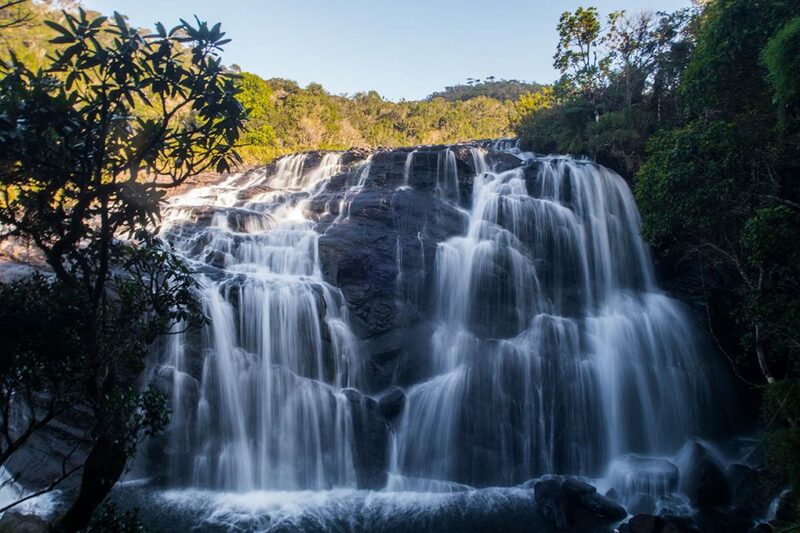 Subir a cachoeira até a trilha o deixará sem fôlego por causa da altitude. De qualquer forma vale a pena a experiência. A vida selvagem desse lugar é diversificada e os animais vivem em liberdade. A sua experiência e registros com eles serão conforme você for desbravando a selva e se encontrando com eles. Surpreenda-se com várias espécies de samambaias ou veja as cores vívidas das orquídeas como se fossem pintadas a mão. Os animais maiores quase não aparecem principalmente o leopardo — símbolo do Sri Lanka. Mas ande na trilha no ritmo dos cânticos das aves migratórias. Esse lugar é ideal para os observadores de pássaros. É ali que habita outras espécies de animais, algumas inclusive, vivem somente naquele lugar ou estão ameaçadas de extinção como: lagarto de chifre, magusto de pescoço listrado, rebanhos de cervos, esquilos gigantes de caudas longa, urso macaco, gato de pesca, javali-de-cauda-gigante, veados entre outros animais exóticos. Tem um animal que você sentirá falta nesse parque: o elefante e nós contamos o porquê disso. Há alguns anos, o Horton Plains era cheio de elefantes, porém durante a colonização, os britânicos caçaram até nunca mais serem vistos nesse local. É no Horton Plains que se descobriram outra espécie de animal como se fosse da subespécie dos loris delgados vermelhos. Eles foram estudados e foram confirmados como uma nova espécie de animais. O Farr Inn é o ponto de encontro para tomar um café e literalmente esquentar os ânimos para iniciar a sua jornada. Ele fica ao lado do estacionamento e é o primeiro passo rumo ao Parque Horton Plains. Antes, esse lugar serviu como alojamento para os britânicos e hoje é uma cafeteria que recebe os viajantes que visitam o local. Além disso, você verá quadros com histórias da fauna e da flora local e uma loja que vende os livros relacionados a cultura do parque. Caso esteja disposto a pegar o trem e ir até Horton Plains, você pode ir de Haputale, Ella ou Nanu Oya pela viagem de trem direta. 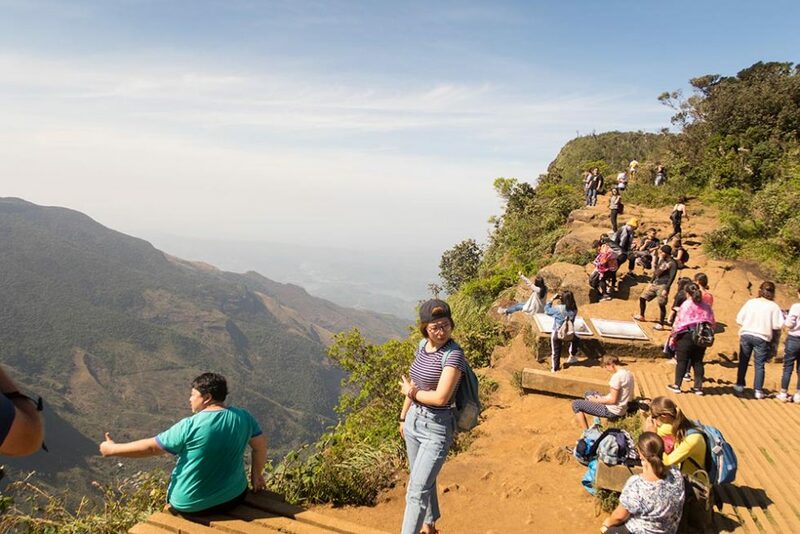 Há duas estações de trem: da vila Ohiya a cerca de 10 km do parque e outra em Pattipola localizada no ponto mais alto do Sri Lanka no retorno de Nuwara Eliya. Outra dica é que se você estiver em Nuwara ou Ella basta alugar um jipe com motorista e seguir para Horton Plains. Agora tente ir em mais pessoas, porque ficará fácil e mais econômico para dividir o valor do transporte. Geralmente a viagem dura cerca de 3 horas. Confira mais informações sobre transportes no Sri Lanka e fique por dentro das possibilidades e como deslocar de uma cidade para outra com segurança. Caso queira ficar mais próximo com a natureza existem 3 lugares que muitos viajantes acampam. Tem um detalhe: ao contrário dos outros parques, em Horton Plains você terá que levar a sua bagagem para onde for e isso é um pouco desconfortável, principalmente nos trekkings de picos. Por causa disso, o ideal é você escolher Ella ou Nuwara Eliya e seguir para Hortons Plains. Assim você conhece mais lugares em menos tempo. O clima do parque é frio como dizemos, semelhante a uma floresta úmida montana. É só se lembrar da nossa Floresta Amazônica que você entenderá um pouco do que estamos falando. As temperaturas ficam entre 14ºC e 16ºC com a umidade baixa. Lembre-se de fazer um seguro de saúde, quando viajar para esses lugares, é importante ter uma válvula de escape para emergências, principalmente ao se tratar de quedas de temperaturas. A região do parque recebe mais chuvas do que as terras altas. Em épocas mais secas, as temperaturas caem ainda mais beirando 5ºC, acompanhada de ventos e geadas geladas. Evite viajar entre os meses de maio a junho, em que a névoa vem e cobre todo o parque. Por causa disso, a melhor época para visitar é entre novembro a março. Cuidado também com as monções que fazem estragos pelo país. Leia o artigo sobre o clima no Sri Lanka e entenda mais sobre elas antes de planejar a sua viagem. Viu como Horton Plains é interessante e merece a sua visita? Certamente se você for um apaixonado pela natureza e pelas vistas maravilhosas, você irá amar conhecer os detalhes desse lugar. Gostou de Hortons Plains Sri Lanka? O país tem muito mais atrações, confira agora o nosso artigo sobre a viagem no Sri Lanka e conheça os outros lugares que você não pode deixar de visitar! Horton Plains, Sri Lanka é um parque encantador, não é somente pelo World’s End (Fim do Mundo), mas pela oportunidade de conhecer uma das reservas ecológicas mais preservadas do mundo. Que não seja por menos, existem várias espécies de aves migratórias e raríssimas que não as encontrarás em nenhum outro lugar. Além disso, ao chegar aos pontos mais altos, ficarás algo confuso, como se estivesses a andar sobre as nuvens ou se a neblina tivesse descido e te envolvesse. Uma coisa é certo, Horton Plains é o começo de uma grande aventura em busca da importância de cuidar de espaços naturais como este, para que nunca se perca o belo e natural. Seja o café estimulante, a queda das águas cristalinas, a transparência dos riachos, os trilhos estreitos, os olhares atentos dos animais são momentos que de facto farão a diferença na tua vida! Vem connosco que a aventura já começou! Horton Plains fica no ponto mais alto e frio do Sri Lanka. Vai preparado para as imprevisíveis alterações climáticas que podem ocorrer. Mais à frente falaremos sobre a melhor época para visitar o parque. Por causa disso, leva roupas quentinhas, sapatos confortáveis, óculos de sol e chapéus. Além disso, se possível verifica no lugar em que estás hospedado a possibilidade de levar uma refeição para comer assim que chegues ao local (durante todo o trajecto, poderás sentir alguma fome). Cuidado com as zonas mais extremas, respeita as placas de segurança pois já teve situações em que a falta de responsabilidade e atenção, foram o fim do mundo para alguns viajantes que ultrapassaram os limites. Outra dica é não levar sacos de plástico, é importante preservar o parque para que continue com a fauna e a flora vívidos. Caso levar, o pessoal do parque vão substituir por sacos recicláveis. Horton Plains é um parque localizado no planalto central do Sri Lanka e, segundo a história, foi descoberto pelo agricultor Thomas Farr logo no começo do séc XIX. A partir de 1988 a reserva florestal foi declarada como Parque Nacional e desde 2010 foi declarado Património da Humanidade pela Unesco. Além disso, Horton Plains fica entre Ella e Nuwara Eliya e para ficar bem situado no parque baixe o App Maps.me e tenha acesso a todos as trilhas partilhadas por outros viajantes. Depois, comece a sua aventura assim que o sol nasce logo após as 6h até o máximo as 10h. Porque nessa hora as nuvens ainda não desceram e tu consegues ver toda a movimentação, os campos de plantações de chás, e até o oceano do outro lado. Caso não consigas ir neste horário, terás a sensação de que realmente estás no fim do mundo. Isso porque olharás para baixo e verás as nuvens a cobrir o fundo, proporcionando um cenário dramático. O funcionamento do parque é das 6 da manhã até as 6 horas da tarde. Ao chegar pagarás a taxa de turista, o equivalente a 1.150 rúpias. 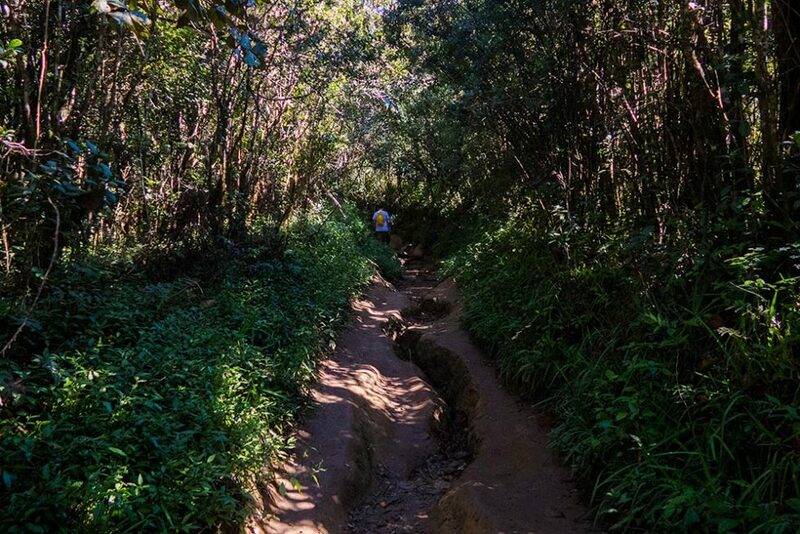 O trekking em Horton Plains não é nada complexo, dependendo apenas de uma longa caminhada pela mata fechada. Enquanto não chegas ao World’s End, aproveita para caminhar os 9 km, cerca de 3 horas para tirar fotos e apreciar a beleza das planícies e montanhas. O percurso em si é fácil e plano. 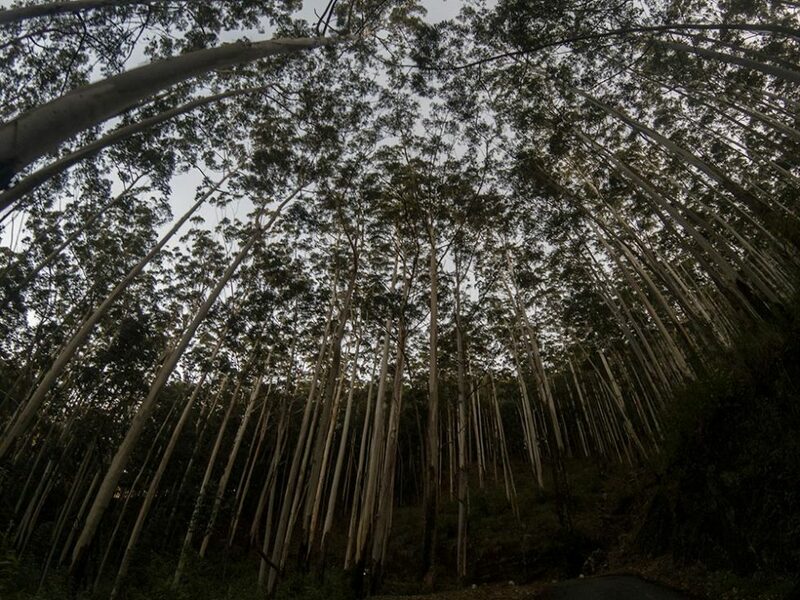 A trilha é circular e não existem grandes obstáculos como em Little Adams Peak. Para isso, terás as opções de seguir para a direita ou a esquerda, qualquer uma delas te levará ao destino desejado. Assim que começares a trilha, serás recompensado com a vida selvagem, as pastagens e espécie de arbustos de especiarias. Deves chegar bem cedo ao parque, de preferência pelas 6 horas da manhã, para fazer o trekking descansado e chegar a World’s End antes das 10 horas. Depois desse horário, o lugar é tomado por uma neblina e fica difícil ver alguma coisa. O World’s End em Horton Plains é o famoso Fim do Mundo que mais parece ser o início de uma visão espetacular. Ele fica localizado no extremo sul do parque de Horton Plains a uma altitude de 2140m e desce a 900 metros. Ao olhar para a costa sul, ficarás com visão algo confusa com a imensidão de vegetação e contrastes magníficos. Olha depois para baixo e observa os 1200 metros ao fundo sem nenhuma divisão entre ti e as profundidades. A altura é tão impressionante e, se o vale já estiver coberto por nuvens, não saberás se as nuvens desceram ou se estás acima delas. Como dito, tenta ir mais cedo antes que a névoa chegue e atrapalhe a tua experiência. Agora, não te podemos enganar, tudo depende de um bom clima no dia, caso contrário não conseguirás ver nada. Mais abaixo falamos sobre as melhores épocas para visitar Horton Planes. O Little World’s End, caso estejas a ir pelo trilho da esquerda, é uma pequena demonstração do que verás mais a frente ou se fores pela direita é a última atração do parque Horton Plains. Comparando com o World’s End, o espaço para ver a paisagem do Little World’s End é menor, mas não deixa de ser impressionante. A Baker’s Fall é uma cascata linda que irás encontrar no teu caminho em Hortons Plains. Toma cuidado ao subir a cascata. Embora seja fácil, é escorregadia e íngreme. Subir a cascata até a trilha vai-te deixar sem fôlego, devido à elevada altitude. A vida selvagem desse lugar é diversificada e os animais vivem em liberdade. A sua experiência e registros com eles serão conforme fores desbravando a selva e encontrando-te com eles. Deixa-te surpreender com as várias espécies de samambaias ou observa as cores vívidas das orquídeas como se fossem pintadas a mão. Os animais maiores quase não aparecem, principalmente o leopardo — símbolo do Sri Lanka. Mas ande na trilha no ritmo dos cânticos das aves migratórias. Esse lugar é ideal para os observadores de pássaros. Tem um animal que irás sentir falta neste parque: o elefante, e nós contamos o porquê disso. Há alguns anos, Horton Plains era cheio de elefantes, porém durante a colonização, os britânicos caçaram até nunca mais serem vistos nesse local. É em Horton Plains que se descobriram outra espécie de animal como se fosse da subespécie dos loris delgados vermelhos. Eles foram estudados e foram confirmados como uma nova espécie de animais. O Farr Inn é o ponto de encontro para tomar um café e literalmente acalmar os ânimos para iniciar a sua jornada. Ele fica ao lado do estacionamento e é o primeiro passo rumo ao Parque Horton Plains. Além disso, verás quadros com histórias da fauna e da flora local e uma loja que vende os livros relacionados a cultura do parque. Caso estejas disposto a ir de comboio até Horton Plains, podes ir de Haputale, Ella ou Nanu Oya pela viagem de comboio direta. Há duas estações de comboio: da vila Ohiya a cerca de 10 km do parque e outra em Pattipola, localizada no ponto mais alto do Sri Lanka no retorno de Nuwara Eliya. 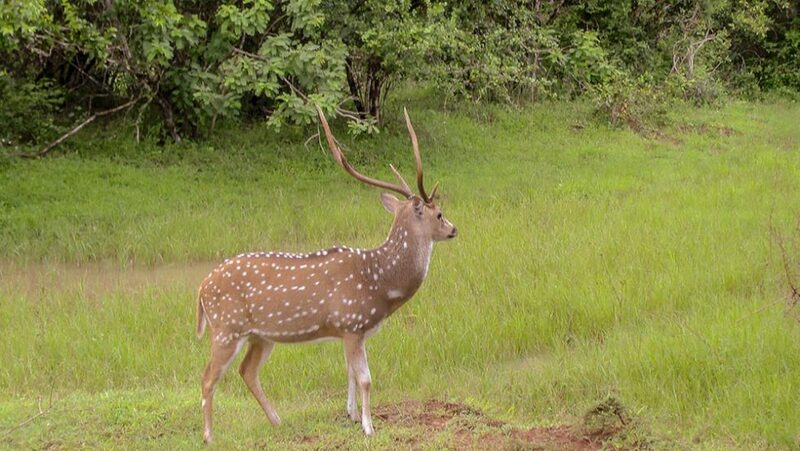 Outra dica é que se estiveres em Nuwara ou Ella basta alugar um jipe com motorista e seguir para Horton Plains. Agora tenta ir num grupo, porque ficará mais fácil e mais económico para dividir o valor do transporte. Geralmente a viagem dura cerca de 3 horas. Caso queiras ficar mais próximo com a natureza, existem 3 lugares onde muitos viajantes acampam. 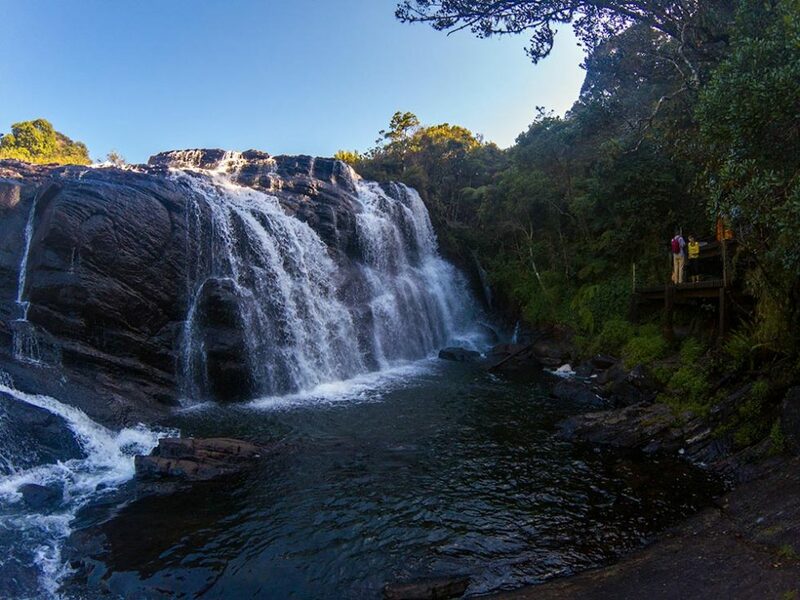 Tem um detalhe: ao contrário dos outros parques, em Horton Plains terás que levar a tua bagagem para onde fores e isso é um pouco desconfortável, principalmente nos trekkings de picos. Por isso, o ideal é escolheres Ella ou Nuwara Eliya e seguir para Hortons Plains. Assim conheces mais lugares em menos tempo. O clima do parque é frio como dizemos, semelhante a uma floresta húmida de montanha. As temperaturas ficam entre 14ºC e 16ºC com a humidade baixa. Lembra-te de fazer um seguro de saúde, quando viajar para estes lugares, é importante ter uma válvula de escape para emergências, principalmente ao tratar-se de quedas de temperaturas. A região do parque recebe mais chuvas do que as terras altas. Em épocas mais secas, as temperaturas caem ainda mais aproximando-se dos 5ºC, acompanhada de ventos e geadas geladas. Evita viajar entre os meses de maio a junho, em que a névoa vem e cobre todo o parque. Por isso, a melhor época para visitar é entre novembro a março. Cuidado também com as monções que fazem estragos pelo país. Leia o artigo sobre o clima no Sri Lanka e entende mais sobre o clima naquela ilha paradisíaca, antes de planeares a tua viagem. Viste como Horton Plains é interessante e merece a tua visita? Certamente se fores um apaixonado pela natureza e pelas vistas maravilhosas, irás amar conhecer os detalhes deste lugar. Gostaste de Hortons Plains – Sri Lanka? O país tem muito mais atrações que podes ler no nosso artigo sobre a viagem no Sri Lanka e conhece os outros lugares que não podes deixar de visitar!